Robert Rogers (7 November 1731 – 18 May 1795) was an American colonial frontiersman. Rogers served in the British army during both the French and Indian War and the American Revolution. 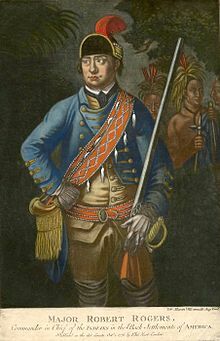 During the French and Indian War, Rogers raised and commanded the famous Rogers' Rangers, trained for raiding and close combat behind enemy lines. Robert Rogers was born to Ulster-Scots settlers, James and Mary McFatridge Rogers on 7 November 1731 in Methuen, a small town in northeastern Massachusetts. At that time, the town served as a staging point for Scots-Irish settlers bound for the wilderness of New Hampshire. In 1739 when Rogers was eight years old, his family relocated to the Great Meadow district of New Hampshire near present-day Concord, where James founded a settlement on 2,190 acres (8.9 km2) of land which he called Munterloney, after a hilly place in Derry, Ireland. Rogers referred to this childhood residence as "Mountalona". It was later renamed Dunbarton, New Hampshire. In 1740, the War of the Austrian Succession (1740–1748) broke out in Europe and, in 1744, the war spread to North America where it was known as King George's War (1744–1748). 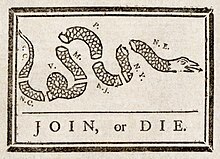 During Rogers' youth (1746), he saw service in the New Hampshire militia as a private in Captain Daniel Ladd's Scouting Company and, in 1747, also as a private in Ebenezer Eastman's Scouting Company, both times guarding the New Hampshire frontier. In 1754, Rogers became involved with a gang of counterfeiters. He was indicted but the case was never brought to trial. In 1755, war engulfed the colonies, spreading also to Europe. Britain and France declared war on each other. The British in America suffered a string of defeats including Braddock's at the Battle of the Monongahela trying to capture Fort Dusquense. Encouraged by the French victories, American Indians launched a series of attacks along the colonial frontier. During the French and Indian War, Israel Putnam (who would go on to later fame in the Revolutionary War) fought as a Connecticut militia captain in conjunction with Rogers, and at one point saved his life. In 1756, Rogers arrived in Portsmouth, New Hampshire, and began to muster soldiers for the British Crown, using the authority vested in him by Colonel Winslow. Rogers' recruitment drive was well supported by the frightened and angry provincials due to attacks by American Indians along the frontier. In Portsmouth, he also met his future wife Elizabeth Browne, the youngest daughter of Anglican Reverend Arthur Browne. Robert's brothers James, Richard, and possibly John all served in Rogers' Rangers. Richard died of small pox in 1757 at Fort William Henry. His corpse was later disinterred and mutilated by hostile Indians. Rogers raised and commanded the famous Rogers' Rangers that fought for the British during the French and Indian War. This militia unit operated primarily in the Lake George and Lake Champlain regions of New York. They frequently undertook winter raids against French towns and military emplacements, traveling on sleds, crude snowshoes, and even ice skates across frozen rivers. Rogers' Rangers were never fully respected by the British regulars, yet they were one of the few non-Indian forces able to operate in the inhospitable region despite harsh winter conditions and mountainous terrain. Rogers showed an unusual talent for commanding his unit in conditions to which the regular armies of the day were unaccustomed. He took the initiative in mustering, equipping, and commanding ranger units. He wrote an early guide for commanding such units as Robert Rogers' 28 "Rules of Ranging". The Queen's York Rangers of the Canadian Army, the U.S. Army Rangers, and the 1st Battalion 119th Field Artillery all claim Rogers as their founder, and "Rogers' Standing Orders" are still quoted on the first page of the U.S. Army's Ranger handbook. Rogers was personally responsible for paying his soldiers, and he went deeply into debt and took loans to ensure that they were paid properly after their regular pay was raided during transport. He was never compensated by the British Army or government, though he had reason to believe that he should have his expenses reimbursed. For more details on this topic, see Battle on Snowshoes (1757), Battle on Snowshoes and Battle of Carillon. From 1755 to 1758, Rogers and his rangers served under a series of unsuccessful British commanders operating over the northern accesses to the British colonies: Major General William Johnson, Major General William Shirley, Colonel William Haviland, and Major General James Abercromby. At the time, the British could do little more than fight defensive campaigns around Lake Champlain, Crown Point, Ticonderoga, and the upper Hudson. During this time, the rangers proved indispensable; they grew gradually to twelve companies, as well as several additional contingents of Indians who had pledged their allegiance to the British cause. The rangers were kept organizationally distinct from British regulars. Rogers was their acting commandant, as well as the direct commander of his own company. On 21 January 1757 at the First Battle of the Snowshoes, Rogers' Rangers ambushed and captured seven Canadiens near Fort Carillon but then encountered a hundred French and Canadian militia and Ottawa Indians from the Ohio Country. Roger's forces retreated after taking casualties of 14 killed, nine wounded, and six missing or captured; the French-Indian forces were 11 killed, 27 wounded. British forces surrendered Fort William Henry in August 1757, after which the Rangers were stationed on Rogers Island near Fort Edward. This allowed them to train and operate with more freedom than the regular British forces. On 13 March 1758 at the Second Battle of the Snowshoes, Rogers' Rangers ambushed a French and Indian column and, in turn, were ambushed by enemy forces. The Rangers lost 125 men in this encounter, as well as eight men wounded, with 52 surviving. Rogers estimated 100 killed and nearly 100 wounded of the French-Indian forces; however, the French listed casualties as a total of ten Indians killed and seventeen wounded. On 7 July 1758, Rogers' Rangers took part in the Battle of Carillon. In 1758, Abercromby recognized Rogers' accomplishments by promoting him to Major, with the equally famous John Stark as his second in command. Rogers now held two ranks appropriate to his double role: Captain and Major. In 1759, the tide of the war turned and the British advanced on the city of Quebec. Major General Jeffrey Amherst, the newly appointed Commander-in-Chief of British forces in North America, had a brilliant and definitive idea. He dispatched Rogers and his rangers on an expedition far behind enemy lines to the west against the Abenakis at Saint-Francis in Quebec, a staging base for Indian raids into New England. Rogers led a force of two hundred rangers from Crown Point, New York, deep into French territory to Saint-Francis. At this time, the Indians near Saint-Francis had given up their aboriginal way of life and were living in a town next to a French mission. Rogers burned the town and claimed to have killed 200; the actual number was 30 killed and 5 captured. Rogers losses were 41 killed; 7 wounded 10 captured. Following the 3 October 1759 attack and successful destruction of Saint-Francis, Rogers' force ran out of food during their retreat back through the rugged wilderness of northern Vermont. The Rangers reached a safe location along the Connecticut River at the abandoned Fort Wentworth. Rogers left them encamped, and returned a few days later with food and relief forces from Fort at Number 4, now Charlestown, New Hampshire, the nearest British town. The destruction of Saint-Francis by Rogers was a major psychological victory, as the colonists no longer felt that they were helpless. The residents of Saint-Francis, a combined group of Abenakis and others, understood that they were no longer beyond reach. Abenaki raids along the frontier did not cease, but significantly diminished. For more details on this topic, see Fort Detroit or Fort Pitt. Quebec fell in 1759, followed by Montreal in 1760. Indian activity ceased against colonials in the east, and Rogers' service there was over. 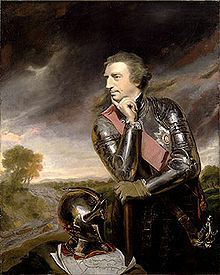 General Amherst transferred him to Brigadier General Robert Monckton, commanding at Fort Pitt (formerly Fort Duquesne). Following Amherst's advice, Monckton sent the rangers to capture Detroit, far to the north, which they did. On 29 November 1760 in Detroit, Rogers received the submission of the French posts on the Great Lakes; during the spring 1761, Rogers and his Rangers occupied Fort Michilimackinac and Fort St. Joseph. It was the final act of his command. Shortly thereafter, his rangers were disbanded. Monckton offered Rogers command of a company of regulars in South Carolina but, after visiting the place, Rogers chose instead to command another company in New York. That unit was soon disbanded, however, and Rogers was forced into retirement at half-pay. No longer preoccupied with military affairs, Rogers returned to New England to marry Elizabeth Browne in June, 1761, and set up housekeeping with her in Concord, New Hampshire. Like many New Englanders, they had indentured servants and slaves, including an Indian boy captured at Saint-Francis. Some historians[who?] claim that the state of Rogers' finances at this time is not compatible with what he and others professed it to be later. Rogers received large grants of land in southern New Hampshire in compensation for his services. He sold much of it at a profit and was able to purchase and maintain slaves. He deeded much of his land to his wife's family, which served to support her later. In peacetime, Rogers was a restless spirit. The colonists were in the process of quelling Indian operations piecemeal. Late in 1761, he accepted command of a company of mercenaries for the purpose of "pacifying" the Cherokees in North Carolina, after which he returned home. On 10 February 1763, the French and Indian War came to an end with the Treaty of Paris (also known as the Treaty of 1763). Rogers found himself once more a soldier of fortune, still on half-pay. Later, General Thomas Gage remarked that, if the army had put him on whole pay, they could have prevented his later unfit employment (Gage's terms). For more details on this topic, see Siege of Fort Detroit and Battle of Bloody Run. On 7 May 1763, Pontiac's Rebellion erupted in Michigan. Odawa war-leader Pontiac attempted to capture Fort Detroit by surprise with a force of 300 warriors. However, the British commander was aware of Pontiac's plan, and his garrison was armed and ready. Undaunted, Pontiac withdrew and laid siege to the fort. Eventually, more than 900 Indian warriors from a half-dozen tribes joined the siege of Fort Detroit. Upon hearing this news, Rogers offered his services to General Jeffrey Amherst. Rogers then accompanied Captain James Dalyell with a relief force to Fort Detroit. Their ill-fated mission was terminated at the Battle of Bloody Run on 31 July 1763. In an attempt to break Pontiac's siege, about 250 British troops led by Dalyell and Rogers attempted a surprise attack on his encampment. However, Pontiac was ready, supposedly alerted by French settlers, and he defeated the British at Parent's Creek two miles north of the fort. The creek or run was said to have run red with the blood of the 20 dead and 34 wounded British soldiers and was henceforth known as Bloody Run. Captain James Dalyell was one of those killed. Soon after these events, Pontiac's rebellion collapsed and Chief Pontiac himself faded away into obscurity and death. Surprisingly, Rogers later memorialized Pontiac and his rebellion in a stage play during his sojourn in England. Rogers had brought total dedication to his position as commander of the rangers. As was often the custom in the British and American armies, he had spent his own money to equip the rangers when needed and consequently had gone into debt. In 1764, he was faced with the problem of repaying his creditors. To recoup his finances, Robert engaged briefly in a business venture with the fur trader, John Askin, near Detroit. After it failed, he hoped to win the money by gambling, with the result that he was totally ruined. His creditors put him in prison for debt in New York, but he escaped. In 1765, Rogers voyaged to England to obtain pay for his service and capitalize on his fame. His journals and A Concise Account of North America were published. Immediately thereafter, he wrote the stage play Ponteach [Pontiac]: or the Savages of America (1766), significant as an early American drama and for its sympathetic portrayal of American Indians. He enjoyed some moderate success with his publications (though Ponteach was condemned by the critics) and attracted royal attention. He had an audience with King George III, to whom he proposed undertaking an expedition to find the Northwest Passage. 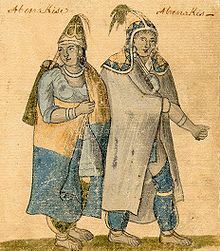 The King appointed Rogers governor of Michilimackinac (Mackinaw City, Michigan) with a charter to look for the passage, and he returned to North America. Upon his return to America, Rogers moved with his wife to the fur-trading outpost of Fort Michilimackinac and began his duties as royal governor. During Rogers' absence, Amherst had been replaced by Thomas Gage as commander of the British forces in America, and Gage was a bitter rival of Amherst. Rogers was a loyal friend of Amherst and was consequently hated by Gage. As an aristocrat and political intriguer, Gage viewed Rogers as a provincial upstart who posed a threat to his newly acquired power, due to his friendship with Amherst. At the time, Rogers was still a half-pay captain in the British army and, to some degree, under Gage's military jurisdiction. However, Gage could not challenge Rogers, the king's appointee, unless he could find a good reason, as the king would countermand any legal process in order to save his favorites. Knowing this, Gage actively set about finding a solid justification to remove Rogers as royal governor in a way that would forestall royal intervention. Unaware of Gage's plotting, Rogers continued performing his administrative duties with considerable zest. He dispatched expeditions to search for the fabled Northwest Passage under Jonathan Carver and James Tute, but they were unsuccessful and the path to the Pacific Ocean remained undiscovered until the expedition led by Alexander MacKenzie in 1793. Rogers perceived a need for unity and a stronger government, and he negotiated with the Indians, parlayed with the French, and developed a plan for a province in Michigan to be administered by a governor and Privy Council reporting to the king. This plan was supported by George III, but had little chance of being adopted, since Parliament had no intention of increasing the king's power. Meanwhile, Gage used every opportunity to defame Rogers, portraying him as an opportunist who had gotten rich on the war only to gamble away his money as a profligate. It is difficult to say how many of these allegations were true and how much Gage believed them to be true. Gage apparently saw Rogers as of questionable loyalty—certainly he was not loyal to Gage—and therefore he needed watching. Rogers' dealings with the American Indians troubled Gage, as he and many other British officers in America had come to regard the Indians with great suspicion. Gage hired spies to intercept Rogers' mail and suborned his subordinates. Unfortunately, Rogers offended his private secretary Nathaniel Potter, and Potter gave Gage the excuse that he needed. Potter swore in an affidavit that Rogers said that he would offer his province to the French if the British government failed to approve his plan of governance. Potter's claims are questionable. The French were not in any position to receive Rogers, with a British governor sitting in Montreal. Nevertheless, on the strength of Potter's affidavit, Rogers was arrested in 1767, charged with treason, and taken to Montreal in chains for trial. This trial was postponed until 1768. Elizabeth, carrying their only child, went home to Portsmouth. This son became a lawyer in Portsmouth and had a family that has descended to modern times. Gage sent Rogers to Montreal to stand trial but, once there, Rogers was among friends of Amherst. Due to Amherst's influence, Rogers was acquitted of all charges and the verdict was sent to King George III for approval. The king approved, but could not call Gage a liar openly. Instead, he made a note that there was reason to think Rogers might have been treasonous. Returning to Michigan under the power of Gage was unthinkable; hence, Rogers went to England in 1769 to petition again for debt relief. However, the king had done all he would for Rogers and was preoccupied by the issue of the dissatisfied colonies. Rogers went again to debtors' prison and tried suing Gage for false imprisonment. Gage settled out of court by offering Rogers the half-pay of a Major in return for dropping the suit. Because of his legal troubles in England, Robert Rogers missed the major events in the disaffected colonies. He heard that revolution was likely to break out and returned to America in 1775. The Americans were as out of touch with Rogers as he was with them, looking upon him as the noted ranger leader and expecting him to behave as one; they were at a total loss to explain his drunken and licentious behavior. At that time, Rogers was perhaps suffering from the alcoholism that blighted his later life and led to the loss of his family, land, money, and friends. It is unclear exactly what transpired between the revolutionary leaders and Rogers. Rogers was arrested by the local Committee of Safety as a possible spy and released on parole that he would not serve against the colonies. He was offered a commission in the Revolutionary Army by the Continental Congress, but declined on the grounds that he was a British officer. He later wrote to George Washington asking for a command, but instead Washington had him arrested. He escaped from Washington's custody only to find revolutionary ranks firm against him, so he offered his services to the British Army. They also were hoping that he would live up to his reputation. In August 1776, he formed another ranger-type unit called the Queen's Rangers as its Colonel. In September 1776, Rogers assisted in the capture of Nathan Hale, a spy for the Continental Army. A contemporaneous account of Hale's capture is in the Library of Congress, written by Consider Tiffany, a Connecticut shopkeeper and Loyalist. In Tiffany's account, Rogers did not believe Hale's cover story that he was a teacher, and lured him into his own betrayal by pretending to be a patriot spy himself. In May 1777, the British Army forcibly retired Rogers on grounds of "poor health." A return home now was impossible; Hale's execution and Rogers raising troops against the colonials seemed to confirm Washington's suspicions. At Washington's prompting, the New Hampshire legislature passed two decrees regarding Rogers: one a proscription and the other a divorce from his wife on grounds of abandonment and infidelity. She could not afford any friendship or mercy toward Robert now if she expected to remain in New Hampshire. Later, Elizabeth married American naval officer John Roche. She died in 1811. After a brief sojourn in England, Rogers returned in 1779 to raise the King's Rangers in Nova Scotia, Canada for General Sir Henry Clinton. He was unable to keep the position due to his alcoholism, and his place was taken by his brother James. Now he was of no further use to the British army. He was snared by an American privateer and spent some time in a prison in New York, escaping in 1782. In 1783, he was evacuated with other British troops to England. There, he was unable to earn a living or to defeat his alcoholism. He died in obscurity and debt in 1795, what little money he had going to pay an arrears in rent. He was buried in London but his gravesite has been lost. John Paul Jones' ship during the American Revolutionary War was named USS Ranger in honor of Robert Rogers and his famous rangers. The few early triumphs of the Continental Navy during the War for Independence were achieved by the Ranger. Under John Paul Jones' command, this famous ship would later witness the second salute to the American flag by a foreign country. On 30 May 2005, (Memorial Day in the U.S.), a statue of Rogers was unveiled during a ceremony on Rogers Island in the Hudson River, 40 miles (64 km) north of Albany, New York. This is near to the site where Rogers penned his "Rules of Ranging." Rogers is mentioned respectfully in "The Ranger Handbook" which is given to every soldier in the U.S. Army's Ranger School, and is referred to in that publication as the originator of ranger tactics in the American military. The Handbook summarizes Rogers' principles of irregular warfare as presented in "Robert Rogers' 28 "Rules of Ranging"." Methuen High School, in the town in which Rogers was born, uses the "Rangers" as their mascot. Rogers' heroics in the French and Indian War, including the search for the Northwest Passage, and his later life are depicted in the novel Northwest Passage (1936) by Kenneth Roberts. The novel inspired the 1940 film Northwest Passage, starring Spencer Tracy as Major Rogers. The novel and film inspired the 1958–1959 NBC TV series Northwest Passage, starring Keith Larsen as Rogers. Rogers is a central antihero in the 2014 AMC drama Turn: Washington's Spies, portrayed by Angus Macfadyen. ^ Brumwell, Stephen (2005). White Devil: a True Story of War, Savagery, and Vengeance in Colonial America. Cambridge, Mass. : Da Capo. p. 13. ISBN 978-0-30681-389-4. ^ a b Bahmanyar, Mir (26 September 2006). Shadow Warriors: A History of the US Army Rangers. Bloomsbury USA. p. 14. ISBN 978-1-84603-142-7. ^ a b Black, Robert (October 1984). "The Beginning of the American Ranger". Gung-Ho. pp. 20–22. ^ a b Drummond, Josiah (1903). "The Two James Rogers". Collections. III. Manchester Historic Association (N.H.). pp. 97–106. ^ a b Stacey, C. P. (1979). "Rogers, Robert". In Halpenny, Francess G (ed.). Dictionary of Canadian Biography. IV (1771–1800) (online ed.). University of Toronto Press. ^ Loescher, Burt Garfield (2001). History of Rogers Rangers: Officers and Non-commissioned Officers. Heritage Books. ISBN 978-0-7884-1967-6. ^ Hubbard, Robert Ernest (2017). Major General Israel Putnam: Hero of the American Revolution. Jefferson, North Carolina: McFarland & Company, Inc. pp. 77–78. ISBN 978-1-4766-6453-8. ^ "Winwood Serjeant Letters 1769-1840". Cambridge Historical Society. Archived from the original on 14 December 2013. Retrieved 29 October 2012. ^ Todish, Timothy J. (2002). The Annotated and Illustrated Journals of Major Robert Rogers. Fleischmanns, N.Y.: Purple Mountain Press. ISBN 978-1-93009-820-6. ^ Ankony, Robert (2009). Lurps: A Ranger's Diary of Tet, Khe Sanh, A Shau, and Quang Tri (revised ed.). Lanham, Mass. : Rowman & Littlefield Publishing Group. p. 177. ISBN 978-0-76184-372-6. ^ Ross, John F. (Summer 2009). "Wilderness Ordeal". American Heritage. Vol. 59 no. 2. ^ Rogers, Mary Cochrane (1917). "A Battle Fought on Snow Shoes". USGenNet. Archived from the original on 4 May 2006. ^ "Frigid Fury: The Battle on Snowshoes, March 1758". The New York State Military Museum. p. 2. Retrieved 29 January 2018. ^ Rogers, Robert (1765). A Concise Account of North America. London: J. Millan. Retrieved 27 March 2008. ^ Katcher, Philip R. N. (1973). Encyclopedia of British, provincial, and German army units, 1775–1783. Harrisburg, Pa.: Stackpole Books. p. 98. ISBN 978-0-8117-0542-4. ^ Hutson, James (August 2003). "Nathan Hale Revisited: A Tory's Account of the Arrest of the First American Spy". Information Bulletin. Library of Congress. 62 (7). Retrieved 29 January 2018. ^ "Nathan Hale". U.S. History.com. Retrieved 29 January 2018. ^ "Nathan Hale, American Patriot". American Revolution. 2005. Archived from the original on 21 April 2009. ^ "Capt. Robert E. Rogers (1731-1795)". Find a Grave. Retrieved 29 January 2018. ^ "Timing of statue's unveiling upsets veterans". USA Today. 28 May 2005. Retrieved 28 January 2018. ^ a b Bateman, Robert (18 October 2009). "The Original Lone Ranger". Washington Post. Retrieved 29 January 2018. ^ "Northwest Passage". IMDb. Retrieved 29 January 2018. ^ "Turn". AMC TV. Retrieved 22 April 2014. Cuneo, John R. (1958). "The early days of the Queen's Rangers August 1776—February 1777". Military Affairs. 22 (2): 65–74. doi:10.2307/1984633. ISSN 0026-3931. Cuneo, John R. (1959). Robert Rogers of the Rangers. New York: Oxford University Press. ISBN 0-931933-46-3. OCLC 1610697. Widder, Keith R. (2004). "The 1767 maps of Robert Rogers and Jonathan Carver: a proposal for the establishment of the colony of Michilimackinac". Michigan Historical Review. 30 (2—Mapping in Michigan and the Great Lakes region (part 1)): 35–75. doi:10.2307/20174081. ISSN 0890-1686. Zaboly, Gary S. (2004). A True Ranger: The Life and Many Wars of Major Robert Rogers. Garden City Park, NY: Royal Blockhouse. ISBN 0-9761701-0-8. OCLC 61311390. "Descendants of James Rogers, Father of the Rangers". montalona.com. Contains descendants of Robert Rogers, James Rogers, Samuel Rogers and his other siblings. "Major Robert Rogers of the Rangers". U.S Army Ranger Ring. Archived from the original on 19 March 2008. "Robert Rogers Journal of the Siege of Detroit 1763". Clarke Historical Library. Walker, Joseph B. (January 1885). "Robert Rogers the Ranger". The Bay State Monthly. Boston: John N. McClintock & Co. 2 (4): 211–225. Archived from the original on 4 May 2006 – via USGenNet. "Roger's Rangers". USGenNet. Archived from the original on 5 March 2008. Saunderson, Rev. Henry H. (1876). "Major Robert Rogers - Revenge 1759". A History of Charlestown, NH. Archived from the original on 5 March 2008 – via USGenNet. Potter, C. E. (1851). "Chapter XV: The French War". The History of Manchester, formerly Derryfield, in New Hampshire. Archived from the original on 20 February 2009 – via USGenNet. Robinson, J. Dennis (2005). "The Tarnished Tale of Robert Rogers". seacoastnh.com.